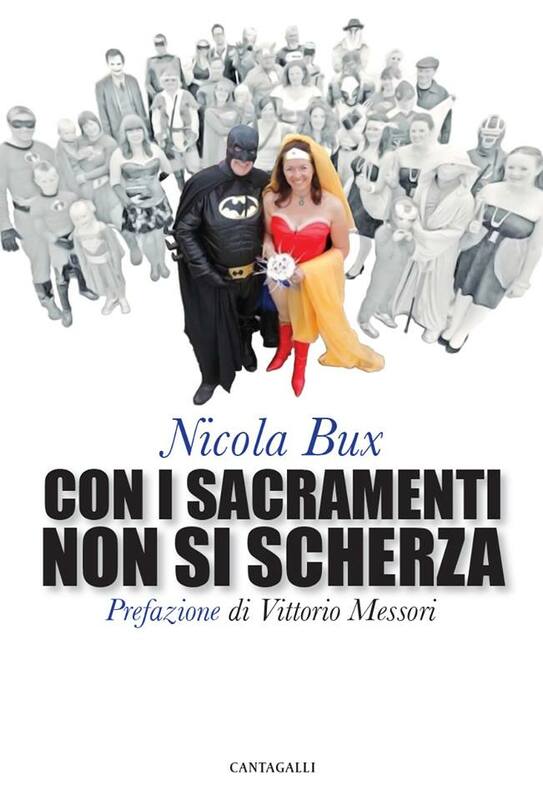 On 2nd April 2016, members of Juventutem Soleto attended Holy Mass offered by Don Nicola Bux, and a presentation of his book Con i sacramenti non si scherza – prefaced by Vittorio Messori. This July, His Excellency Bishop Athanasius Schneider, will celebrate Mass and lead catechesis for the young adults of Juventutem at the World Youth Day festival in Krakow, Poland. 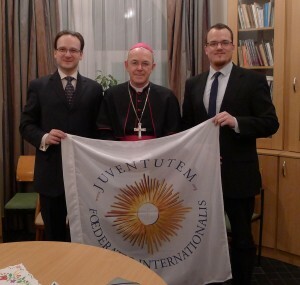 In advance of WYD, His Excellency met with Bertalan Kiss, the new President of the Juventutem federation, during a visit to Hungary. WYD 2016 KRAKOW JUVENTUTEM Registrations now OPEN! World Youth Day, to be held from July 25th to August 1st in Krakow, Poland, is right around the corner. Those who wish to attend Mass in the Extraordinary Form of the Roman Rite can do under the patronage of the Federatio Internationalis Juventutem (FIJ) group, organized by Krakow’s youth. 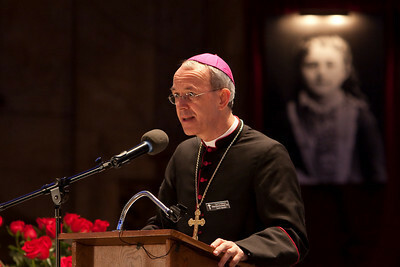 During the meetings the daily Mass celebrant will be His Excellency Bishop Athanasius Schneider of Kazakhstan. The Bishop will also lead catechesis sessions. 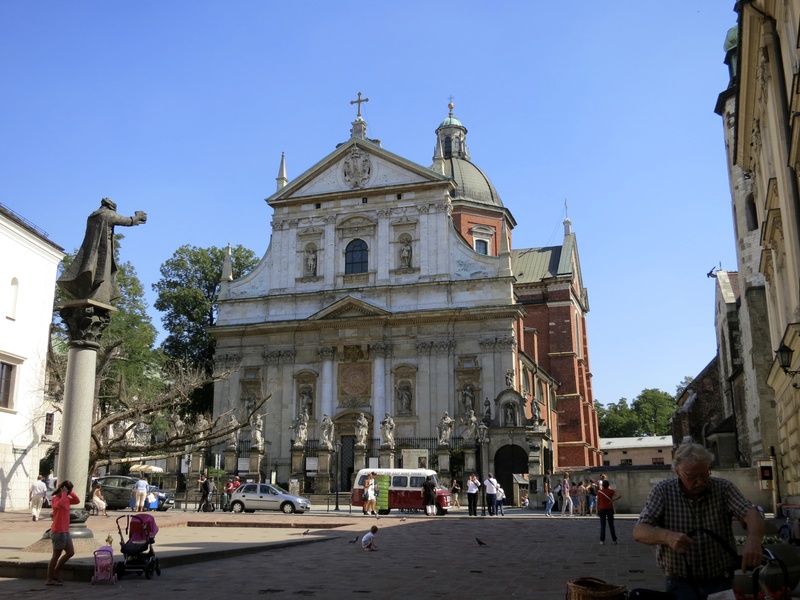 All of the events for our group will take place in the very heart of Krakow at Saints Peter and Paul Church on Grodzka Street https://en.wikipedia.org/wiki/Saints_Peter_and_Paul_Church,_Krak%C3%B3w . The Juventutem movement is already registered as a macrogroup, however, direct registration for pilgrims is carried out in subgroups counting up to 150 people. Every chaplain or lay leader registers his own members, in accordance with his needs, as a sub-group. If you plan on coming to Krakow for WYD or would like to help the youth in your ministry or group, we request that you inform us of your subgroup at tradiWYD2016@gmail.com. We will then create a subgroup in the WYD system, for which you will have a login and password, and which you will be able to use according to your needs. The registration page directs all those interested through all the steps, including payment. As usual, Extraordinary Form clergy will accompany the young adults and will hear confessions, give lectures and take part in the liturgy. They include priests and seminarians from various countries, with Fr Armand de Malleray, Ecclesiastical Assistant to the FIJ. 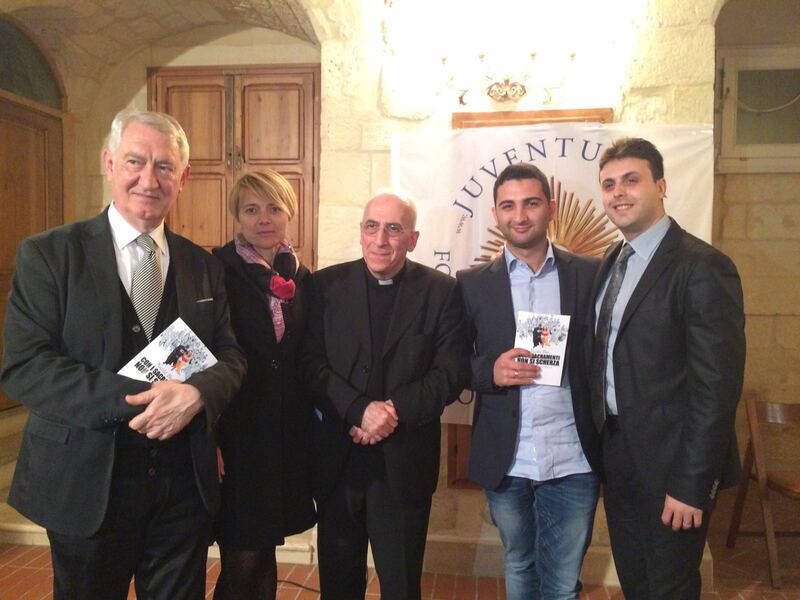 On Monday 1st September 2014, Pope Emeritus Benedict XVI granted Cosimo Marti, co-founder and treasurer of the Foederatio Internationalis Juventutem (FIJ) a private audience at his residence in the Vatican. 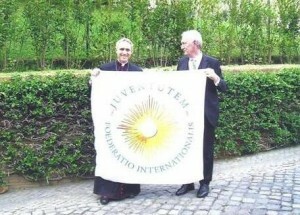 One year earlier, before the resignation of Benedict XVI, Cosimo had requested to meet him on behalf of Juventutem. Last July, he received a surprise letter from the Apostolic Nunciature in Bern, the Swiss feral capital where the Juventutem headquarters are located. The Nunciature sent a letter from Archbishop Georg Gänswein, Prefect of the Pontifical House. 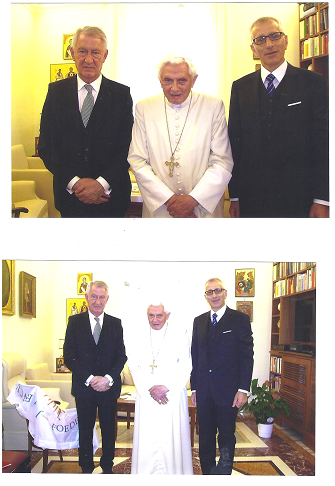 It contained an invitation, no longer expected, to a meeting with Benedict XVI. Marti had assumed that his request had been filed with the resignation and was not expecting an answer any longer. The letter stated that he could bring a friend. After discussing it with Juventutem staff, Marti chose Giuseppe Capoccia, Director of Summorum Pontificum Coetus Internationalis, who has organized the International Pilgrimage of Tradition in Rome since 2012 Summorum Pontificum Populus. The pilgrimage will take place in October 2014 for the third time at the tomb of the Prince of the Apostles. The pilgrimage is being held out of gratitude for the 2007 Motu Proprio Summorum Pontificum granted by Pope Benedict XVI, to free all priests in the celebration of the traditional form of the Roman rite. During the audience, which lasted for half an hour, Cosimo thanked Pope Benedict for his support to the young people attached to the Roman traditions of the Church. Pope Benedict assured Cosimo of his prayers for all the young people. 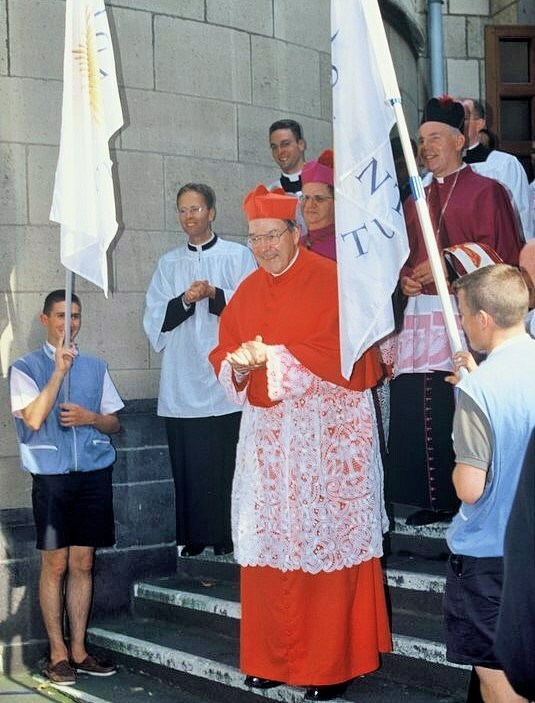 Indeed, one thousand young adults attended WYD 2005 in Germany under Juventutem banner, out of one million in total present at the Papal Mass at Marienfeld. This gives a significant ratio of one young adult out of one thousand committed to those traditions, not to mention the many others who attended unregistered or simply had not yet heard about it. The International Juventutem Federation is pleased to announce that His Eminence George Cardinal Pell, Prefect of the Secretariat for Economy, has kindly accepted our invitation to be the Celebrant at a Pontifical Solemn High Mass according to the Missal of St John XXIII on Friday 24 October 2014, 6:30pm, at Santissima Trinità dei Pellegrini, Parish Church of the Priestly Fraternity of St Peter in Rome, Italy. The Holy Sacrifice will be offered in thanksgiving for the tenth anniversary of Juventutem, the worldwide youth movement fostering the sanctification of the young through the Roman traditions of Holy Mother Church. We are grateful to His Eminence who generously presided at Solemn Pontifical Vespers organised by Juventutem during World Youth Days in the past, first in Düsseldorf on 17 August 2005, and again in Sydney on 16 July 2008. After Vespers in Düsseldorf, Cardinal Pell gave the following encouragements to the young WYD pilgrims of Juventutem: “I am happy to be here because the old Latin rite is one of the most beautiful things in the entire Western civilization. And I am very glad that this ancient rite has its place in the Church today. I am happy because this rite helps you to love God and to love one another. In this ancient rite we always see that our prayer is an act of worship. It is impossible to see a celebration like these Vespers as something horizontal. We have one Church only, whose Head is the Successor of Peter, with the Bishops as successors of the Apostles, and this unity is very important for the life of the Church” (translated from the original French). Members and supporters of Juventutem are cordially invited to make arrangements to be in Rome and attend the Mass, which will be preceded by other Juventutem activities (full schedule to be advertised soon). 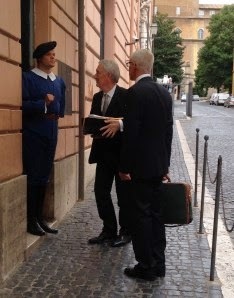 All pilgrims in Rome are naturally invited as well, regardless of their involvement with Juventutem. 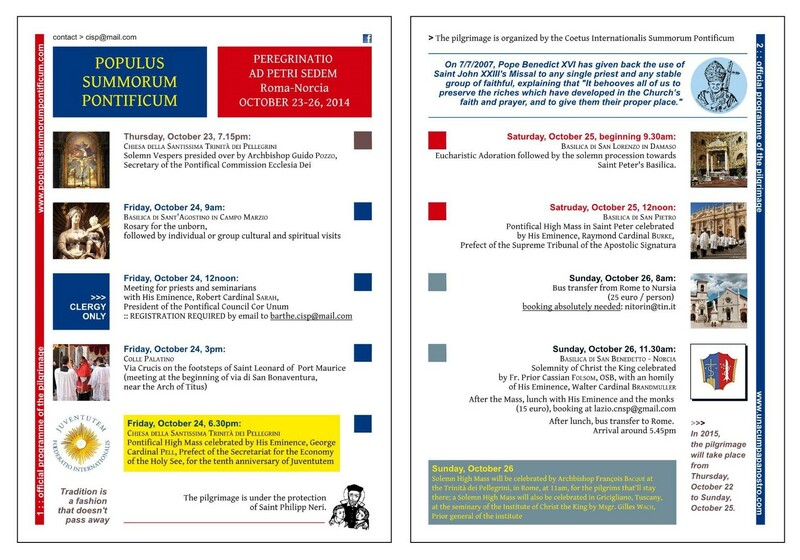 The event will be part of the Populus Summorum Pontificum Pilgrimage 2014. The following day, on Saturday 25 October, His Eminence Raymond Leo Cardinal Burke, Prefect of the Supreme Tribunal of the Apostolic Signatura, will celebrate a Solemn Pontifical High Mass according to the Extraordinary Form of the Roman Rite in Saint Peter’s Basilica, at 12:00 noon. Signed: International Juventutem Federation, on 27 May 2014.